The new 2 way Car Alarm System is a very long range 2 way car alarm using LoRa technology. This alarm is feature packed, with most functions switch-able from the remote control, so you can decide how you want to use this alarm. The alarm can sense proximity detection, ignition tampering, door opening and vibration sensing . Any event is shown on the remote via radio signal, showing how the alarm was triggered. It features immobilisation, automatic window closing, trunk release, automatic central locking and remote engine start. 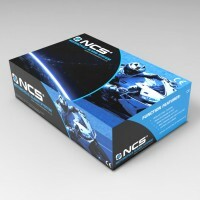 The Remote engine start and Microwave proximity detector upgrade options are included for FREE! There is also a battery backup option available- see our battery backup sirens. This alarm is feature packed, with most functions switch-able from the remote control, so you can decide how you want to use this alarm. However please bear in mind this is a complicated alarm to fit and not for the novice DIYer! FREE programmable Remote start option. The alarm, if you choose, can start your car from the key fob ( some cars will need the immobiliser bypassing ). This feature is fully programmable for length of time the engine runs for (and how long your heater also runs for), making this ideal for cold mornings. Internal temperature display. Shows the temp when you disarm the alarm- so you can decide if you want to run the engine and warm up the car! FREE Microwave proximity option. The microwave proximity sensor is a far better detection system than ultrasonic as it will detect a hand coming through an open window. The device sensitivity is adjustable. LoRa Technology. Ensures a very long range, low interference remote range. SPY claim up to 5000 metres, though this will be reduced once the antenna is installed behing the metal panels of your car. Automatic window closing . The unit will auto close any open windows when the alarm is set. 12 MONTH WARRANTY. Gives you peace of mind. Remote and Automatic Central Door Locking. Saves messing about and it locks up your “wheels” for you. Automatic Rearm( Can be turned off ) . Means your alarm will arm itself if you forget to..
Anti hijack and intruder function. If someone takes your car you can kill the engine. Your “wheels” are then safe and the thief is *###**! You can also operate this while in the car if someone tries to jump in. Hot wire warning / immobilisation. If an object is placed in your ignition or wires cut the alarm will go off and immobilise your car. Other alarms connect purely to the ignition and are very easily bypassed by thieves. As soon as this happens you are alerted by your key fob! Remote trunk / boot release. Why not- it does everything else! Door Open Warning. Warns you if you leave the doors open or if they are opened by a thief. Car finding / panic alarm, You will not spend hours searching the car park again! Silent alarm. In case you do not want to upset your neighbours I guess. Accidental disarm. Should you disarm the alarm by accident and don’t open the door, then the alarm will re-arm itself. Emergency disarm. Should you lose your fobs. Power off memory.If the power supply is interupted the alarm will remain in the setting you left it in. It will not disarm itself! Valet / service mode. Sets the alarm for when the car is being serviced. 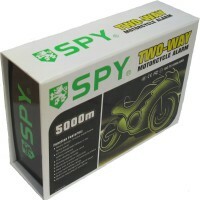 SPY Full feature Car alarm system with Remote Start, Trunk release, Proximity detection. The list goes on! 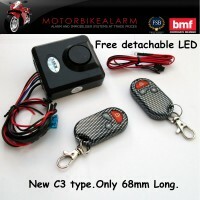 INTELLIGENT BATTERY BACKUP SIREN FOR NCS / CLCLONE CAR ALARMS.